Bacon. We all love it. We all want it. It’s even been called The Gateway Meat, for its ability to make vegetarians fall off the meatless wagon. Can it get any better…? Um, yes. Yes it can. 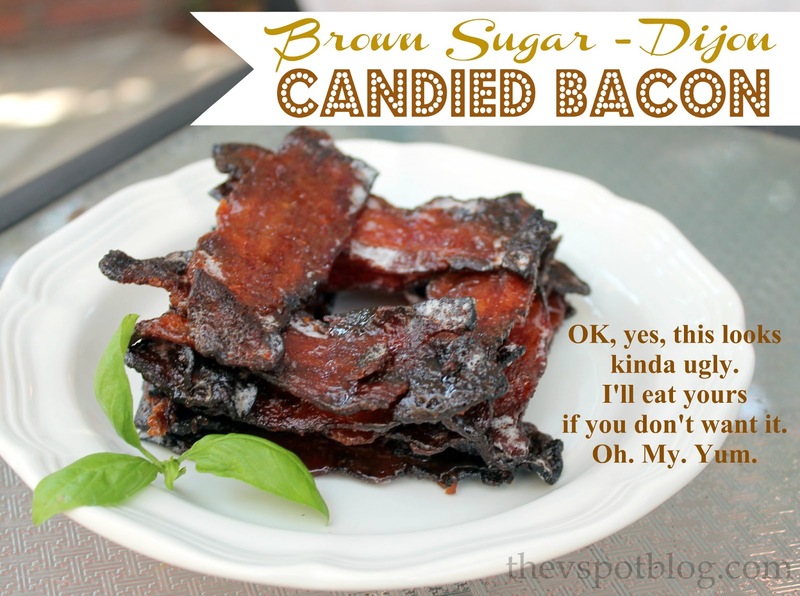 I give you: Brown Sugar-Dijon Candied Bacon. I saw this a few weeks ago on The Today Show and had to give it a try myself. It could not be any easier. You need about a cup of brown sugar, 3 tablespoons or so of Dijon mustard and a pound of good bacon. In a gallon size plastic bag, mix the sugar and mustard until you have a gooey looking paste. 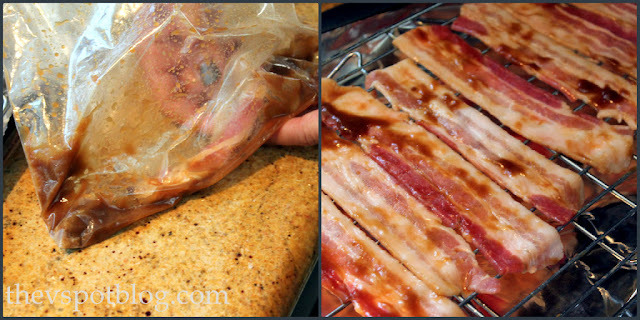 Take the slices of bacon and put them in the bag, one at a time to coat with the mixture. You will need to manipulate the outside of the bag (sort of squish with your hands) to make sure the bacon is covered. Lay the slices on a rack on top of a foil lined baking sheet and place in a 400 degree oven for about 15 or 20 minutes. I did 2 racks at a time and had to keep rotating the baking sheets. Also, this is NOT something to make right before guests arrive. Unless you have eye drops and gas masks for them to wear, you want to cook this in advance. As the sugar drips down onto the foil it will start to burn and to smoke. I was able to lift the rack and put new foil down mid way through the baking process. That helped with the smoke. Anyway, I am sure that with practice I can figure out how to get this totally crispy without the edges getting too done, but I have to be honest. Nobody cared what this looked like. People were arm-wrestling to get the last piece. It’s salty-sweet-tangy goodness. 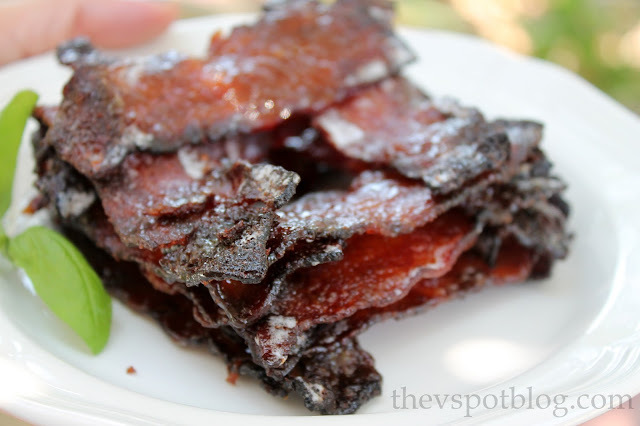 I have never seen an appetizer get hoovered up the way this little pile of bacon did. Give it a try! Soooooo good! Holy Bacon, Batman! This looks amazing!!! OK I discovered this at last year’s Taste of Atlanta. Made me lose my mind it was so good. I’ve made it several times since. Most notably I crumbled it and put it on top of the sweet potatoes at Thanksgiving. It’s easier than it seems and amazing. Just put spices (cracked black pepper, cinnamon, ginger) and brown sugar in a bowl, coat the bacon, spray PAM on your oven rack and lay the bacon right on it. Put a cookie sheet under to catch the drippings. BAM! Heaven.